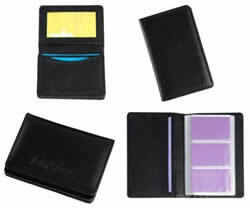 With their elegant and professional look, leather business card holders create a powerful first impression. Even with the constant evolution of technology and our favourite gadgets, the printed business card still appears to be the most common way for the professional business person to present their personal contact details. Whether we like it or not the majority of people will make a judgement about us based on an initial impression. When you give away leather business card holders as promotional gifts your clients will appreciate the subtle way that you are helping them create that all important first impression. Leather card holders definitely hold an edge over any other type of card holders. They are elegant and classy and have a professional look that you won’t find in holders made of any other material. So why is it so important? How does it help for you to give out these classy looking business card holders as corporate gifts? It’s simple really. You know that all of the people you are doing business with are sure to have their very own business cards printed. Today, everyone, from salespersons and business people to consultants, all use business cards as a way not just to introduce themselves but also as a way to stay in their clients’ memory. When you give out business card holders, you automatically become part and parcel of that whole exercise. Why not make that moment count? When you give leather card holders, you create an impression not just on the recipient but on everybody else who networks with your recipient. What’s really great about leather is that it is so very versatile. You can get it in a range of colors as well as textures adding another dimension to an item that is already stylish on its own. Black, brown, tan and wine are the most popularly used colors mainly because they go well with any color ensemble that a person is wearing. 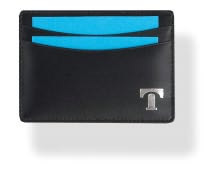 A person may be hesitant to take out brightly colored card holder from their pocket but with more muted colors, you know they will look for any occasion to whip it out and show it off to everybody around. You can get leather holders that are smooth with a glossy finish, smooth with a matte finish or even more innovative ones that have a more grainy texture or those that have embossed designs. No matter what color or texture combination you choose, you know your recipient will love it. When you are giving away leather business card holders as corporate gifts you will want to personalize the gift with your company name and company details. One of the reasons behind the gift is that you want to promote your company and your brand and you cannot do this unless the gift is personalized. What’s so great about leather business card holders is that they are so easy to personalize and better still, they have so much advertising space available. You can emblazon your company name across it and also include your brand logo and your contact details without making it look too crowded or tacky. You know that every professional always likes to keep cards on hand to give away to their potential prospects. When you give out leather business card holders your gift is sure to be appreciated and used and every time that it is used, it helps to promote your brand too. You just cannot go wrong with a gift like this. We have over 16yrs experience in a wide range of promotional products including business card holders, and across many different sectors.